In the early 1970’s the provincial government wanted to tear down the old courthouse (now the Vancouver Art Gallery) and erect a 55 story tower in its place. The city objected and the old court house was saved from demolition. Arthur Erickson was chosen to create a plan for the new courthouse. His solution was to lay the tower on its side making it more accessible physically and philosophically. Erickson describes his general conceptual philosophy as “architecture that is in dialogue with the world” (qtd. in Biography Erickson, Web). 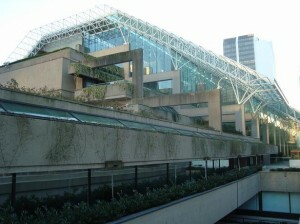 The Provincial Law Courts and Robson Square exemplify this character and underline his unique west coast design. These structures seamlessly diffuse human spaces with light and their natural surroundings. Designed by Erickson in 1973, the seven story Law Courts are a very modern design distinguished by an angular sloping glass roof over an acre in size that seemingly balances on a maze of protruding orthogonal concrete beams and posts. The horizontal design is three city blocks long by one city block wide and the concrete itself is a special mixture that turns rosebuff color when wet. Cornelia Oberlander is the landscape architect whose ornate design juxtaposes the terraces connected by the many stairs and crossing sloping concrete ramps with reflecting ponds, waterfalls, walkways, and concrete planters of flowers, trees and various vegetation. The rooftop garden stretches out to the north side where the structure spills you out into Robson Square. Stairs lead down below street level where there is an ice rink. 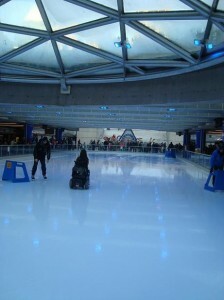 It crosses below Robson Street and stairs lead up to the Vancouver Art Gallery connecting the new courthouse with the old courthouse.